As a guideline the cost of a high quality wet underfloor heating system should be around £ 12 to £ 14 per sq. m. subject to floor area and type of project. Guideline price excludes any potential extras such as aluminium heat emission plates or overlay panels etc. An install service is available as an additional option at approx £ 5 to £ 6 per sq. m. for large enough projects. Assuming standard installation method such as ‘pipe clipped to insulation’. Timber suspended floors and ‘tie-pipe-to-mesh’ methods are more time consuming and so more expensive. For small heated floor areas the ufh kit will be more expensive than above mentioned guideline costs. Many customers ask us if wet underfloor heating is cheaper or more expensive than radiators? The answer is that an underfloor heating system is probably 10 % -20 % more expensive to purchase, but then again the running cost is lower for water underfloor heating. Another common question is if water underfloor heating is cheaper or more expensive than electric underfloor heating? The answer is simple. 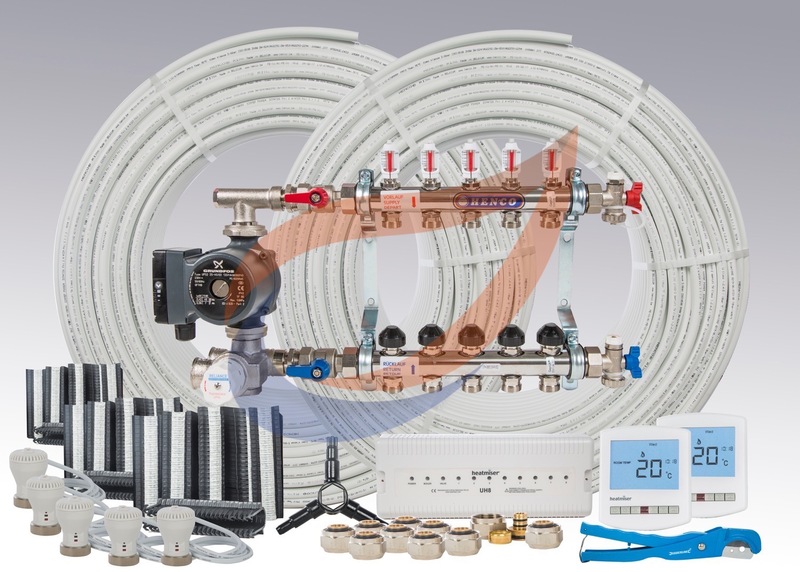 An electric underfloor heating kit is cheaper to buy, however the running cost is much higher compared with any wet underfloor heating system. Electric underfloor heating is mainly fitted in small wet rooms such as WC/en-suites and bathrooms where they may in some situations be more practical.